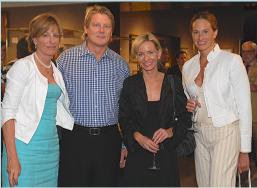 Oceana, an international conservation group, held a cocktail party at Christie's Auction House on July 24, 2006 from 6 to 8 p.m. in Rockefeller Center... 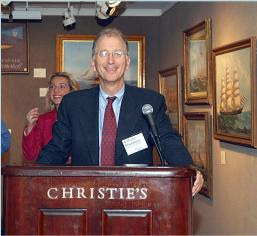 It was a private preview of Christie's world-class Maritime Art and Auction Collection. Oceana supporters, guests other ocean enthusiasts were able to preview the model ships, marine-themed paintings and other ocean-inspired collectibles at the event. The paintings and other collectibles were auction off on July 27th with all proceeds going to Oceana. "Thanks to Christie's generous support, Oceana is making a great splash in our newest home, New York City," said Oceana CEO Andrew Sharpless. "We are incredibly proud to be associated with such an iconic New Yorker as Christie's. We think New York should and can become a leader in ocean advocacy. After all, New York is the largest ocean-facing city on the planet. 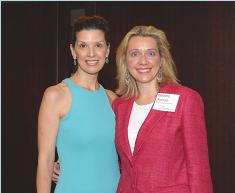 "International Yachtsman Magazine sponsored the event with TOUS, a third generation jewelry company, donating items for onsite drawings. Oceana's mission is to help protect and keep clean oceans for our health as well as the environments. "We can restore ocean ecosystems that will sustain us, entertain us, amaze us and generate jobs around the world for centuries to come." In 2005 alone, this organization has many accomplishments. In the Pacific they have worked to protect the corals and have bycatch limits. They have launched an international campaign that helps to protect our seafood from mercury. Oceana has explored the seas from San Francisco through the Panama Canal to the Mediterranean. The Oceana lawyers won a case to end backroom dealings on Chilean fisheries. Another accomplishment of Oceana is they have successfully campaigned 30 European Nations to establish criminal penalties for anyone dumping oil into the ocean.The Oceana campaign has also put together a "green list" of grocery stores that provide signs to protect you from high levels of mercury in fish. These grocery stores are Carr's, Dominick's, Genuardi's, Pak'n Save Foods, Pavilions, Randalls, Safeway, Tom Thumb, Vons, Whole Foods and Wild Oats. Unfortunately, there are more grocery stores on the "red list" of stores that do not provide you with signs, but Oceana is working to rectify that. Oceana campaigns to protect and restore the world's oceans. Their teams of marine scientists, economists, lawyers and advocates win specific and concrete policy changes to reduce pollution and to prevent the irreversible collapse of fish populations, marine mammals and other sea life. Oceana has campaigners in North America, South America and Europe with over 300,000 members.